Over a year after the former San Fransisco 49er began kneeling at NFL games during the national anthem, the magazine is celebrating his activism in its annual Men of the Year issue. 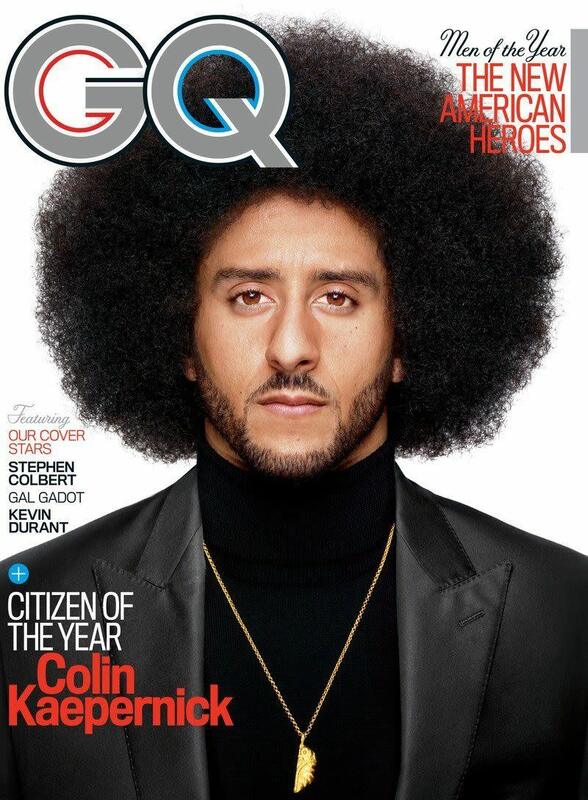 On GQ’s December cover, Kaepernick wears all black with a gold chain and an unapologetic Afro to accentuate his revolutionary look. Kaepernick collaborated with the magazine for a photo shoot in New York City’s Harlem neighborhood ― where, GQ notes, Muhammad Ali once marched with the Nation of Islam in protest of the Vietnam War. Kaepernick, who is not currently signed to an NFL team, told GQ he wanted to participate in the story to “reclaim the narrative of his protest.” Kaepernick began his protest as a way to call attention to systemic racial injustice and police brutality against black people, but in recent months, the kneeling gesture beenco-optedasa general statement of protestagainst President Donald Trump. GQ’s editors spoke with 10 activists, writers and influencers, including Ava DuVernay, J. Cole, Harry Belafonte and Linda Sarsour, about Kaepernick’s character, work and impact.